SUBHEAD: Site available with links to articles, research and testimony letters about the aerial drop. Image above: There is no question that the introduction of rats, by humans, to Hawaii has been a disasters, especially for places like Lehua with ground nesting birds. Poisoning mammals may not directly kill birds but it may kill mammals like monk seals and whales near the shores where poison reaches the water. From (http://www.landcareresearch.co.nz/publications/newsletters/kararehe-kino/kararehe-kino-issue-19/which-toxin-is-best-for-eradicating-rodents). A new website is now live for anyone wanting quick links to articles, research and public testimony letters about the Lehua aerial drop. The link is (https://www.lehua-island-hawaii-conservation.org/). It is a resource for concerned residents, fishermen, journalists and scientists who need reliable information about the project. 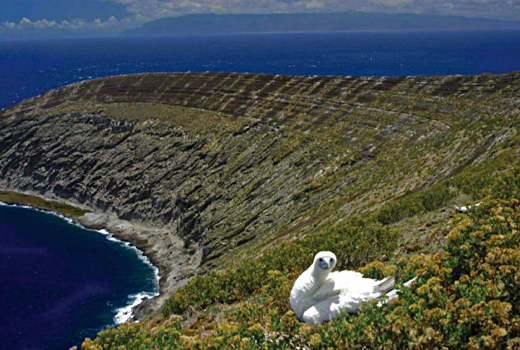 LEHUA ISLAND, 18 miles from Kaua'i in western Hawaii, is a rare and pristine State Wildlife Sanctuary. It harbors Federally-listed endangered and threatened species such as monk seals, green sea turtles, and three species of endangered birds. Endangered loggerhead turtles have been sighted, and a rare species of reef coral (Cosinaraea wellsi) has been reported at a depth of 120 ft. Whales, dolphins, manta rays and eagle rays frequent the area. A native Hawaiian subsistence community of Ni'ihauans, 3/4 mile from Lehua, catches fish and ama crab in Lehua's waters to feed their families. Starting August 8, 2017, the state Department of Land and Natural Resources and US Fish and Wildlife intend to drop approximately 11.5 tons of diphacinone rodenticide on Lehua Island. The diphacinone rodenticide will enter the coastal waters below the high tide line, resulting in an unknown level of collateral damage to non-target species within this precious marine and cultural ecosystem. In their agency comment letters, NOAA, the EPA, Hawaii Department of Health, and many scientists have expressed concern about the lack of baseline, Lehua-specific data to justify the poison drop, as well as lack of a rigorous monitoring commitment and enforcement mechanisms for the proposed biosecurity acitivities. The EPA urged DLNR to conduct effective consultation with the local Hawaiian and marine community. Yet, two native Hawaiian organizations and a representative of OHA submitted comment letters and an Opposition Statement describing environmental justice issues and lack of inclusion in decisionmaking. A public meeting called by DLNR to announce the Final Environmental Assessment for the aerial drop was met with intense community outrage. In 2009 DLNR had conducted a very similar aerial drop of diphacinone on Lehua that failed in its rodent eradication goal. Mortalities that followed included two whales and a large-scale fish die off that agencies claimed were not related to the aerial rodenticide drop. Nevertheless, following the 2009 diphacinone aerial drop, the head of Hawaii Department of Agriculture's Pesticide Branch, prior to his retirement, directed staff "not to issue aerial application permits that might result in pellets entering into marine ecosystems until the EPA develops study protocols for such ecosystems." This Archive provides quick access links to official source documents, research reports and other official information for those wanting to learn more about the concerns raised in the Lehua aerial rodenticide operation. The Archive was assembled through the input of scientists, legal researchers, policy watchdogs and others concerned about the lack of public awareness about this project, questionable statements made by agency staff, and significant omissions within the Environmental Assessment documents approved by the project's state and federal agencies.